Giving away promotional products is one of the best ways to gain visibility for your brand. No matter what kind of business you have, there are numerous products that will remind your customers and prospects of your business. This is a strategy that has both online and offline applications. Indeed, companies have been creating and handing out promo products since long before the days of the internet. In some ways, that makes the strategy especially valuable today. It’s all too easy to become fixated on strictly online techniques and forget that it’s sometimes beneficial to have your name out there in the offline, 3D world. Let’s look at some of the possibilities and benefits for promo products in Phoenix. T-shirts and clothing. One of the most common types of promo products is clothing. T-shirts, for example, are widely used for branding purposes. Global corporations and small businesses alike place their logos on t-shirts, sweatshirts, baseball caps and other wearables. When someone wears your branded t-shirt, he or she becomes a walking billboard for your business. Cups, mugs and water bottles. Another popular type of promo products is the kind people drink from. This is another example of a product that people tend to take with them wherever they go. If someone brings their mug into a coffee shop, it’s there for everyone to see. The same with a water bottle, where your brand becomes visible on city streets, public transportation, hiking trails and lots of other places. Office accessories. Pens, mouse pads, business card holders, staplers and clippers are just some of the office-related items that are brandable. Bags and luggage. Backpacks, messenger bags, laptop bags, briefcases and luggage can all be turned into promo products. People who travel frequently may display your branded bags all over the world. Fitness and sporting goods. Golf accessories, pedometers, yoga mats, arm and wrist reflectors and headlamps for joggers and bicyclists are some of the fitness and sports related products you can brand. These are just a few examples of product ideas. You can tailor this approach to almost any industry or business. 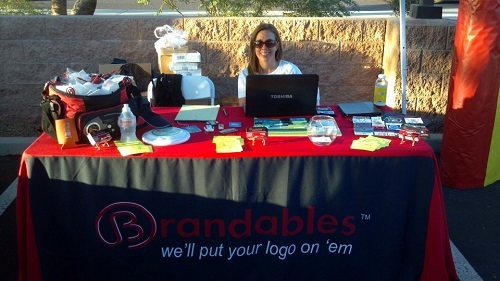 Using promo products in Phoenix gives you a powerful way to attract attention to your brand. Giving away products also helps you connect with people and give them a positive impression of you. Give them to your employees. One way to make use of promo items is to give them to your employees. This can be done in different ways, depending on the context. An obvious example is giving employees in a store t-shirts or caps to wear. However, you can also use them as incentives for strong performances or as contest prizes. However your employees obtain your branded products, you win because this is another way to get more exposure for your brand. It’s also a way to motivate employees and foster team spirit and loyalty. Trade shows and conferences. Giving away products at trade shows and industry conferences is a good way to connect with people. Along with your business card, hand out a product that your audience will appreciate. Mail them out. Another way to distribute promo items is to send them out in the mail. When you have a mailing list, this is a good way to get people to pay attention to your mailings. You can use this in conjunction with your website or email list as well. Advertise that people can receive a free item by filling out their information. This is an especially good strategy if direct mail is part of your marketing. Hand them out in public places. There are numerous ways to hand out items in public. If you have a table at a farmer’s market, block party or festival, this is a good opportunity to hand things out. You might also take a more guerrilla marketing approach and hire people to hand out items on city streets. If it’s a fun product, you could hire outgoing people in costumes to hand them out and attract attention. Online contests or giveaways. Use your website or social media pages to give away promotional products. Setting up contests is a fun way to do this. There are apps for running Facebook and other social media contests. You might also simply give away certain items to the first 100 people who respond. This is a good way to get people on your email list or to spark social media shares. Personalize products. In some cases, you can show your appreciation for a client, employee or anyone by personalizing a promo item. Many items, such as t-shirts and pens, can easily be personalized. This will give the recipient more incentive to wear or carry around the item. Create a positive image. People love to get something for free. This is a way to give people a good impression of your business. Increase loyalty and team spirit. Within your business, giving away promo products makes employees feel better about their jobs and more connected to each other. More memorable than a business card. Handing someone a product makes a bigger impression than simply giving them a business card. Products are tactile and tangible, as opposed to a card that tends to get quickly filed away with hundreds of others. This is a way to differentiate yourself, whether you meet people at networking events, trade shows or anywhere else. Reach a wider audience. Promo products travel along with the people who receive them. In some cases, the person you give an item to will pass it on to someone else. Clothing, bags, mugs and many other products may be seen by lots of people in public places. This lets you reach more people than you could with other methods. When you look at the outreach you get from these products, your cost is actually very low. Add value to people’s lives. When you give something practical to people, you’re making their life easier, even if it’s only in a small way. This is a good first step in establishing a business relationship with someone or creating a new customer. With so many possibilities, how do you decide what kind of promo products to create? This depends on several factors, such as your budget, the type of business you have and what type of marketing you do. For example, if you’re on a limited budget, you may want to stick to cheaper items that you can hand out in bulk. If you have a little more to invest, though, there are definite benefits to making higher quality products, which are longer lasting and make a stronger impression. There’s also the question of whether to make products that are directly related to your industry. This often makes sense. For example, if you’re in the tech sector, making branded mouse pads, flash drives or office equipment is logical. On the other hand, you should also consider the lifestyle of your audience. For example, many business people spend lots of time on the golf course. So giving someone a golf shirt might be appropriate. If you want to really capture people’s attention, you might try to think of a less common item. There’s nothing wrong with using time-tested favorites such as t-shirts, mugs, and keychains. However, keep track of current trends and see if you can come up with something more unusual. It could be a trend in your industry or a more general trend. For example, if you’re thinking of promoting travel bags, pay attention to the latest styles. If a new type of bag or luggage is suddenly fashionable, it’s better to give these away than generic looking backpacks. As with any type of marketing, it’s always wise to test your campaigns. You may find that certain products give you better results than others. This is not quite as easy to quantify as it is with other types of marketing, as you’re mostly giving items away. However, you can gauge the response nonetheless. Certain products may do better in certain environments. You may find, for example, that tech or office-related products do better at trade shows while clothing is more popular crowds in the street. White label products are a great and often under-appreciated way to promote your business in the digital age. You don’t have to look at this as an alternative to more high-tech web-based promotional strategies but as an additional way to brand yourself. As mentioned, there are many ways to combine promo products with online tactics such as Facebook contests or giveaways from your website. At the same time, giving away physical products helps you establish a connection with people in ways that the internet cannot.